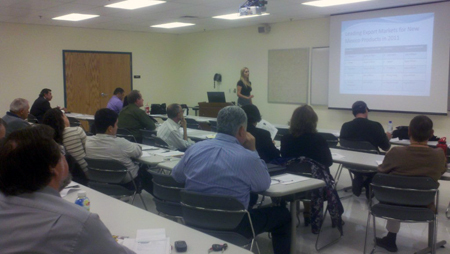 The International Business Accelerator and the Dona Ana Community College Small Business Development Center presented the “Exploring Your Market in Mexico” Trade Seminar on December 5, 2012 at the DACC Workforce Center, located at 2345 East Nevada Ave., Ste. 101, Las Cruces, NM (Room 121). The seminar was held as a joint effort between the Small Business Administration and the New Mexico Small Business Development Centers Network, called the Gateway to Exporting Program. This program assists small businesses export their products and services to the global market. At the seminar, a host of Gateway to Exporting experts addressed topics such as exporting opportunities, U.S. Department of Commerce export programs, the Mexican economy, and Mexico’s maquiladora industry. More than 40 people registered and attended the seminar. Magaly Sanchez of the IBA presenting to the audience.